I anticipate a chorus of agreement when I say that no library is complete without a generous portfolio of books on sumo. In 1995, when I still had hair for a ponytail, I found myself on the streets of Tokyo with my nephew, Sean, who said, “Don’t worry about what you do. 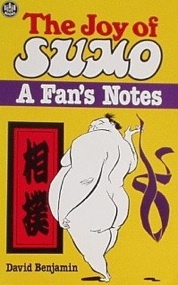 They think you’re crazy already.” So for all you crazy barbarians out there, you hapless gaijin, I begin with The Joy of Sumo: A Fan’s Notes by David Benjamin (Rutland, Vermont & Tokyo, Japan; Charles E. Tuttle Company; 1991). More than a great sumo book, more than a great sports book, this is a great book. The world would be a better place if this book had as wide a distribution as the Gideon Bible. This is the book for those who want to laugh all the way to understanding and enjoying the sport without worrying whether the referee is barefoot, wearing socks, or wearing socks and sandals, and what that means. 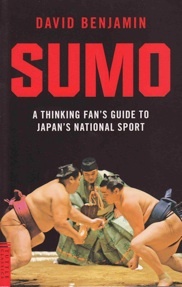 Benjamin loves and knows sumo, and by the end of the book, you will love the sport and Benjamin’s writing. Irony aside, this is a very nice book, with almost 100 sepia-tone photos, including snaps of sumo fans Charlie Chaplin and Jean Cocteau. Kozo clearly knows his stuff. I see this one from time to time on eBay, where it goes for about $30. Worth every penny. Grand Sumo: The Living Sport and Tradition by Lora Sharnoff (New York and Tokyo, Weatherhill, 1989) is for the sumo nerd and I mean that in the most respectful way. This is a graceful, comprehensive, enthralling guide to the sport. 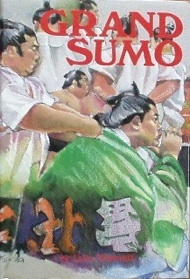 A must-have sumo book with black & white illustrations by Lynn Matsuoka, who is the Mary Cassatt of sumo. 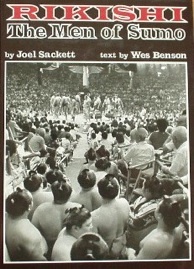 Rikishi: The Men of Sumo by Joel Sackett with text by Wes Benson (New York and Tokyo, Weatherhill, 1986) delivers a gut understanding of what the life of a sumo wrestler, a rikishi, is truly like. Sackett’s color and black & white photographs are beautiful, gritty and evocative, and Benson’s text does them justice. There’s even a recipe for chanko nabe. A magnificent volume. 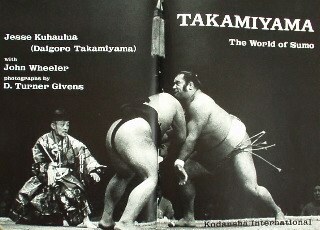 Takamiyama: The World of Sumo by Jesse Kuhaulua with John Wheeler (Tokyo, Kodansha International, 1973) is an autobiography of a Hawaiian who enters the world of sumo and works his way to the top, winning the Emperor’s Cup in 1972. Great glimpse into the world of sumo; inspiring story as well. And hey, I’ve got a signed copy. Life is good. 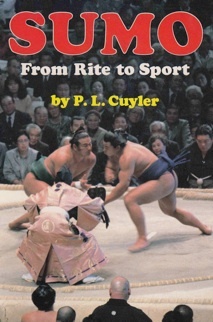 If you’re looking for a good, solid history of sumo, Sumo: From Rite to Sport by Patricia L. Cuyler (New York and Tokyo, Weatherhill, 1987; revised edition) should be just the ticket. Extensive history, loads of black & white illustrations, bibliography, index, a thoroughly enjoyable and professional job. 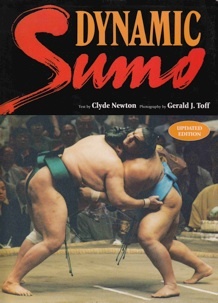 Dynamic Sumo by Clyde Newton with photography by Gerald J. Toff ((Tokyo, New York, London; Kodansha International; 1994) survives its daffy title with fine writing and Toff’s wonderful photography, both color and black & white. Terrific overview. Sumo by Makoto Kubota (San Francisco, Chronicle Books, 1999) is a jumbo book of spectacular sumo photography, color and black & white. A visual feast with a modest amount of almost unnecessary text. If you’re looking for a guide to watching sumo, there are many to choose from, with illustrations of the primary sumo holds and throws. Mark Schilling’s Sumo: A Fan’s Guide (Tokyo, Japan Times, 1994) benefits from illustrations by the aforementioned Lynn Matsuoka. 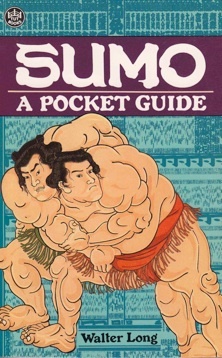 Sumo: A Pocket Guide by Walter Long (Rutland, Vermont and Tokyo; Charles E. Tuttle Company, 1989), with photographs by Joel Sackett, and Sumo Watching by Tsutomu Kakuma (Tokyo, Yohan Publications, 1993) are compact guides that will help the novice get a grip. 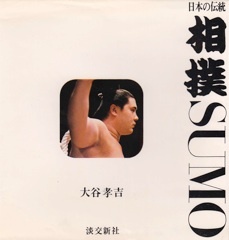 There is also The Essential Guide to Sumo by Dorothea N. Buckingham (Honolulu, Bess Press, 1994). 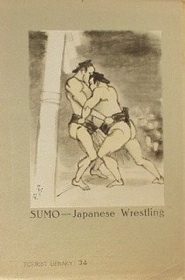 In this genre, I am also partial to the peppy vernacular of Sumo: The Sport and the Tradition by J.A. Sargeant ((Rutland, Vermont and Tokyo; Charles E. Tuttle Company, 1959) written by a Brit with a love of the sport and a flair for sports writing. Another good book is by New Zealander Doug Kendrick, The Book of Sumo: Sport, Spectacle, and Ritual (N.Y. & Tokyo, Weatherhill, 1969). 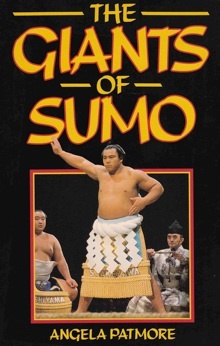 The Giants of Sumo by Angela Patmore (London, Queen Anne Press, 1990) focuses on biographies of many, many sumo greats. I have no idea; my nephew sent it. More to come, as I collect and read them. 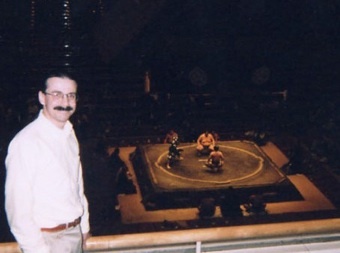 Lastly, the collector on site: Kihm Winship by Sean Winship, at the Kokugikan (Hall of National Sport), Ryogoku, Tokyo, Japan, Wednesday, May 17, 1995.